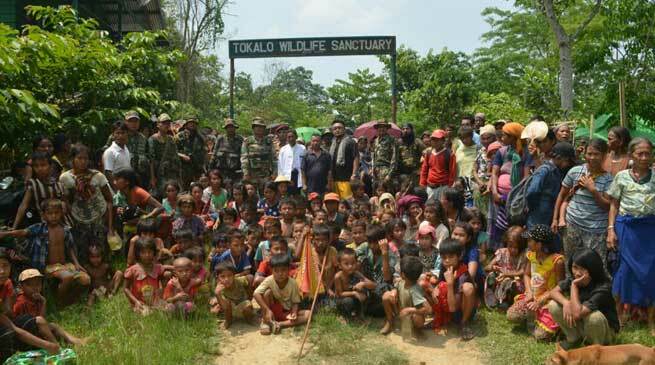 A major refugee crisis which could have lingered and prolonged in Mizoram was successfully averted by Assam Rifles and Civil Administration, Saiha, Mizoram on Thursday. On 19th May 2017, 338 Myanmar Nationals mostly women & children who had crossed over to the Indian side of the International Boundary in South Mizoram, seeking refuge and asylum to evade atrocities from Myanmar based Insurgent group ‘Arakan Army’. The influx of Myanmari refugees occurred at village Lungpuk and Khaikhy in Saiha district, wherein villagers from Ralei village in Myanmar traversed to the Indian side. Assam Rifles being the first responder for the Indo-Myanmar Border immediately sprung into action and sent its team from forward posts and a senior officer of the rank of Lieutenant Colonel was also sent with his team from Lunglei to handle the situation and ensure safe and peaceful return of the refugees to Myanmar. The team also had a Medical Officer to provide the medical and humanitarian assistance to the refugees. The persistent efforts of troops of Assam Rifles under Headquarter Inspector General Assam Rifles (East) who were present at Lungpuk village from the very first day along with the support of DC Saiha, SP Saiha, village council of Lungpuk resulted in paving the pathway for repatriation of the refugees safely back to their homes. The repatriation of the refugees was organised at International Boundary Pillar No 15 of Indo Myanmar Border on 24 May 2017, wherein the VCP of the Ralei village, Myanmar Mr Chebei himself came from Myanmar on 24th May to receive and take back the villagers who had fled from the same village. The villagers who came from Myanmar to receive refugees, on condition of anonymity confided that the Arakan Army Insurgents who were present in the Ralei village and surrounding area have moved away to an undisclosed location towards Myanmar side and the village is now completely safe for the refugees to return to their home. Mr Rachu, Assam Rifles, District Commissioner of Saiha, SP Saiha and MADC for all the support and assistance provided to their villagers at the time of crisis. Tenacious and assiduous efforts by the Assam Rifles and Civil Administration of Saiha not only averted major humanitarian Refugee crisis through synergized effort by Assam Rifles and Civil Administration to further strengthen relations of two nations. The prompt reunion of displaced families from their relative will go a long way to strengthen bonhomie.